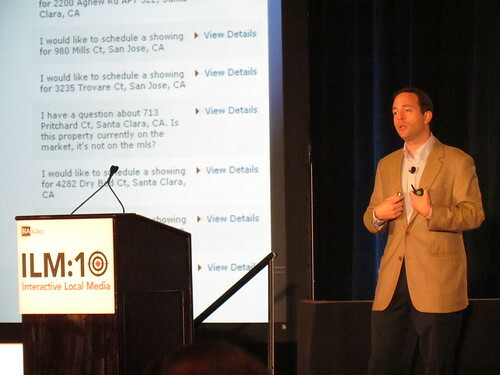 Zillow CEO Spencer Rascoff kicked off Day 2 of ILM:10, dissecting the biggest opportunities to monetize online real estate. Rascoff founded Hotwire before selling to IAC and jumping over to the real estate vertical in 2005. Zillow is now profitable and boasts 12.5 million uniques, growing 64 percent year over year. It’s also pushing hard into mobile, with the top real estate app on iPhone, iPad and Android. Its partnership with Yahoo brings together the two largest online real estate destinations, and last week it integrated agent reviews. But the linchpin is a diversified revenue model that spans four different ad formats. National: Zillow has a large display ad component, given that premium CPMs are demanded by a highly targeted and affluent audience. It also attracts ads for other areas of interest that are complementary to the “life event” of buying a home. “Buying a home coincides with everything from buying a car to getting a phone line,” said Rascoff. Local: Zillow’s local play consists of a premier agent program. Its inside sales team pushes this product to local agents, who pay $2,000 per year on average for a fixed monthly package (varies by ZIP). For that, they get six times greater exposure on Zillow including showcased placement on listings and analytics for leads generated. Mortgage advertising: A logical tie in for mortgage lender lead generation targeting anyone in the process of home buying. Includes mortgage calculators and other user facing tools. Mobile: Real estate search is conducive to mobile because of the portability of the medium during house shopping. For that reason, not surprisingly, mobile traffic spikes on the weekend and drives 20 percent of overall usage (compared with 10 percent during the week). Overall, six homes per second are viewed across its mobile apps, and growing quickly. On the local front, Rascoff walked through a few of the challenges in reaching real estate agents — challenges common to ad sales to all small businesses. Simplicity is a critical factor, he said, including things like flat rate pricing, bundling and direct sales. Video on that segment below. Zillow seems to be great so far. I have been using their featured listings with much success. I make real estate agent websites, so I have to learn about these things. Hi, Should the web site allows special treatment,unfair advantage to some; does everybody that visit Zillow have a equal hand to participate. Not a Zillow fan myself, but Kolsky has an axe to grind. Pretty obvious he’s got issues from reading his Trulia profile. Yes, I have had a problem with said Company but that was not my point; I was asking a valid question, events I know to be true, hopefully can be expressed, and up for discussed? Here is unethical behavior below. It’s unethical and unfair when a group of users are allowed to have different standards. I hope this can start the discussion of zillow and it’s allowed special treatment to a small group. Wait, did you just call the Tavern a dive??? Its a classy joint, full of classy people. As far as the rest of it goes, speaking from experience at another website where we were trying to make a difference, life goes on, even its not according to our ideals. Doesn’t mean we shouldn’t keep on plugging away, trying to do the right thing. Just that we should never overestimate the impact we have. Its all about dollars, unfortunately, not ideals. The premier program does not work, take a look at zillows top contributors, they hate any agent promotes on zillow and stops it from happening???? It does not make sense, zillow wants you to come on in pay them for advertising, meanwhile zillows top contributors/employees agent bash any self promotion??? Please stay away from zillow, trulia is a much better website, you can do everything on it. Guy thinks Zillow is in business to promote him. Real nutbar. Don’t believe me, read his blog.